Sometimes it’s cool to be a square, just ask these hip Square Blue Envelopes. Not afraid to think differently, these unique blue squares are offered in an almost purple looking Primary Translucent and a soothing Ocean Blue. Certain to stand out amongst the bills and junk mail, these Blue 8 x 8 Square Envelopes are destined to brighten up anyone’s day. Not even including the bright blue shades, the square envelope will certainly stand out from all of those rectangles. For all your large square shaped invitation, card, photograph and letter mailing needs, these pretty parallelograms will get the job down. 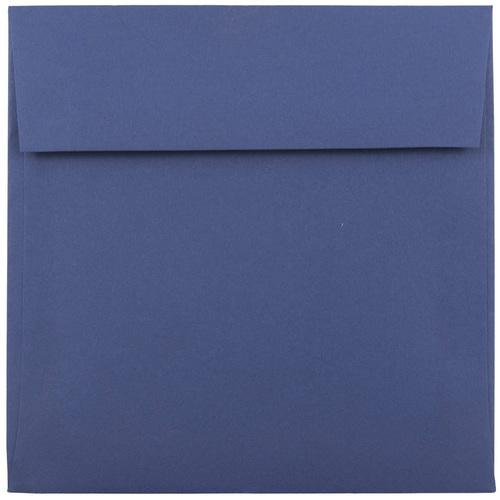 Blue Square Envelopes measure in at an even 8 x 8 and are available in a Primary and Ocean Blue Translucent. Our collection of Translucent Envelopes are some of the most unique envelopes around. They're a great way to give your potential guests and clients a little sneak peek before they see the real thing!